Create user with Manager role: the manager user is used for the initial session, configuring MySQL Enterprise Service Manager, and defining the access control list. The user defined here is added to the default manager role. For more information on the default roles, see Chapter 22, Access Control. Create user with agent role: the Agent user credentials are used by every monitoring agent to connect to MySQL Enterprise Service Manager. The user defined here is added to the default agent role. For more information on the default roles, see Chapter 22, Access Control. This is the user described in Section 3.3.3, “Users Created on First Log-in”. 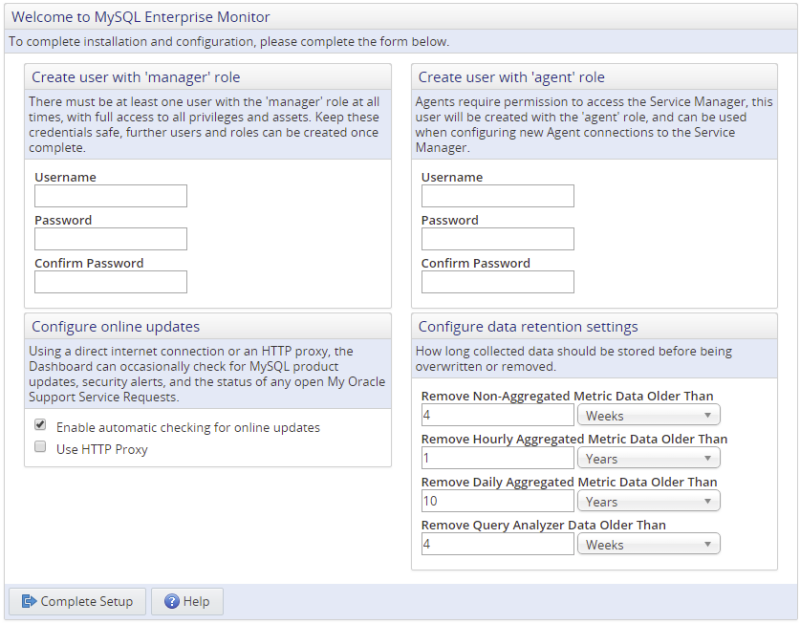 The agent must connect to MySQL Enterprise Service Manager to transmit the monitored data. Record the agent's credentials; this information is required when installing the agent. It is possible to configure additional Agent users should your system require it. For more information, see Chapter 22, Access Control. Configure Data Retention Settings: define how long collected data must be retained. For more information on data purging, see Section 14.4, “Data Purge Behavior”.